If you can live with 2,500 days retention and the not-so-responsive customer support, TweakNews gives you speedy downloads and a capable VPN for a very reasonable price. TweakNews is a veteran Netherlands-based Usenet provider which combines a decent set of features with a very flexible set of payment plans and options. Signing up gets you a useful 2,500 days (or more than six years) of binary retention and guaranteed completion of 99.9%. Free SSL is included to secure your connection, and maybe improve speeds if your ISP is throttling Usenet traffic. Unlimited subscriptions start at €7.95 (£7, $9.25) for a single month, which gets you a maximum of 30 connections and speeds of up to 50Mbit. But you can also buy three or six months of service, or see the price fall to €5.83 (£5.15, $6.80) if you sign up for the annual plan. Upgrading to the Lightning plan doubles maximum speeds to 100Mbit and gives you 40 connections for €7.50 (£6.60, $8.70) a month over a year. 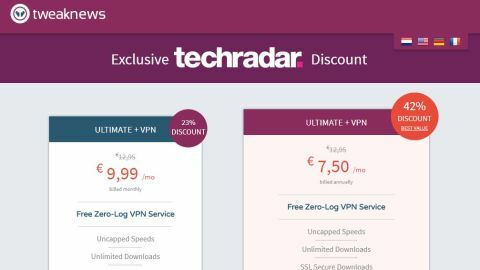 The top-of-the-range Ultimate + VPN plan removes the speed cap and throws in a Highwinds-based VPN for a monthly €9.06 (£8, $10.50). Just in case you need even more flexibility, block subscriptions give you a fixed amount of data which never expires, and can be downloaded at up to 100Mbit. Prices range from only €2 (£1.75, $2.35) for 10GB to €45 (£40, $52) for 500GB. There's a free trial available, although it's more limited than some of the competition. It only supports a maximum of eight connections and up to 10GB of data, while Newshosting gives you 30 connections and 30GB. But if you can live with that, you'll still get a good general idea of the service’s capabilities. TweakNews requires a little more signup information than you might expect. At a minimum this will include your email address, first and last name, and country. If you take the free trial you must verify your identity with a mobile phone number, and there's no Bitcoin payment option: just card, PayPal, Giropay and SOFORT banking. TweakNews doesn't provide any significant information on how it might log or monitor users, or respond to legal requests. The safest assumption is that it's going to be business as usual: if you're detected downloading something you shouldn't, there's a chance you'll be pursued. There is some built-in protection via SSL support which encrypts your traffic to limit what your ISP and others can see. Opt for the top-of-the-range Lightning plan and TweakNews also gives you a Highwinds-based VPN to further protect your identity. It's a fairly ordinary service with 31 locations spread around 21 countries, but performance is above average and it'll do as good a job as any other VPN when it comes to keeping you safe. We signed up with TweakNews and were quickly taken to a web dashboard with details on our subscription, invoices and contact details. User and server names were visible upfront, making it easy for experienced users to set up their own news client. Novices aren't so well-served, but there are download links for a few clients – Usenet Wire, Grabit, NewsBin Pro and SABnzbd+ – and most people should be up and running within a few minutes. TweakNews' VPN client looks ugly and has only the bare essential features: OpenVPN UDP or TCP protocol selection, a choice of ports, DNS and IPv6 leak protection, a kill switch and some startup rules. Location selection is straightforward. A single list displays countries, cities, servers, load and ping times, and you can sort by any of these fields with a click, for example to find the lowest server loads. Unfortunately, whichever location we chose, the VPN refused to properly connect. We eventually tracked this down to a problem with the client's DNS leak protection – turn this on and it uses a Highwinds DNS server which seemingly didn't work on our network. The good news is that once we understood the cause, it wasn't a big deal. Disabling DNS protection allowed us to connect and still gave us an alternative DNS server, so we could safely use the client. The bad news is that if we hadn't figured this out for ourselves, support wouldn't have been much help. We reported our connection symptoms and the DNS error, and a day later we received a reply asking us to test our system using new credentials. A further day after reporting that this didn't help, support told us they would need to escalate this to someone else, and asked us to send screenshots of our settings. This inability to quickly recognize our DNS issue suggests to us that it's not a common problem, and your devices are unlikely to be affected. But the experience also suggested that TweakNews support may struggle with tricky situations, and if you do have issues, it may take some time to get them fixed. Once TweakNews was set up and working, the service delivered everything we needed. VPN performance was above average, just as we would expect from the Highwinds network. Our nearest UK server gave us speeds of around 34 to 38Mbps, and the best US servers still managed an average of 23Mbps, comparable with a good specialist VPN provider. News server speeds proved to be even better. Single connections managed around 8Mbps on our test system, and ramping up to eight allowed us to consistently achieve 40Mbps. Adding more connections doesn't always scale up as you'd think, but with 30 available on even TweakNews' budget plan, we suspect there's going to be more than enough performance here for most people. If you’re looking for a European Usenet service then it’s worth checking out TweakNews. There are more powerful providers out there, offering better retention rates for sure, but you’re still getting solid core features, a capable VPN, along with fair and flexible pricing.